This highly detailed laser cut wargames model joins 4Ground’s growing range of American Legend buildings. 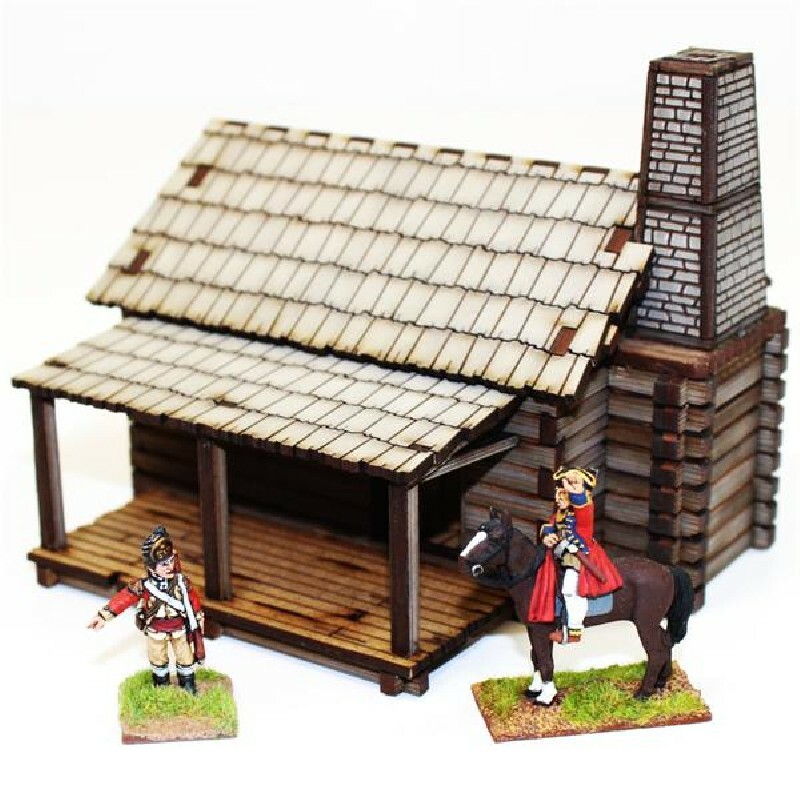 Like many in the range this building makes an ideal objective or terrain piece for The French Indian Wars, The War Of Independence, The War Of 1812-15, the Civil War, Wild West and even early C20th Prohibition Bootleg Gangs. The first New Englanders built Cabins (a single roomed dwelling) and houses with timber framing covered in clapboard sidings and thatched roofs. Later the New English copied the New Swedish Cabins, as these were easy to make using large straight timbers for their horizontal ‘Log On Log’ construction. As time went by the New Englanders developed their ‘Log On Log’ building styles, they cut the over hanging corners off and this became known as New English Cog (as in Cogwheel), which then developed into the very sturdy blockhouse style with its half dovetailing locking corners. Blockhouse cornered dwellings were also more likely to have ridge capping shingles rather than the more rustic overhanging ridge shingle. ‘Log On Log’ cabins with either overhung, cog or blockhouse corners would become so common among Americas future pioneers and settlers that eventually the name “cabin” usually applied to just ‘Log on Log’ dwellings.